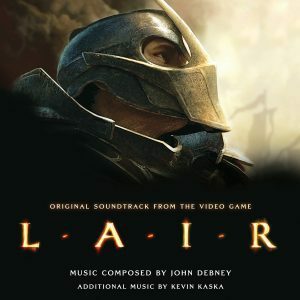 John Debney’s score to Lair was one of those “wow” scores. First heard in a concert suite in Spain in 2007 and then officially released with the game later that year, the score was huge and epic, filled with large orchestral themes and choral music. This new 2-disc album was sourced from 24-bit, 96kHz high resolution audio found in John Debney’s personal archive. Working with Sony Computer Entertainment America (SCEA), as well as Debney, it was definitely a challenge to pull together the album – we had over 2.5 hours of recorded material, as well as 73-minutes of synth demos! With so much music to sift through, including additional music by Kevin Kaska, it was unfortunate that not everything could fit on the album. With Debney’s guidance, decisions were made of what to keep and what to drop that allowed the album to be a solid listening experience. The artwork for Lair was tricky to put together. The game didn’t perform to SCEA’s expectations, and the production company that made the game had folded years ago – so while they were able to find a few art assets, a lot of what I ended up using came from online sources that retained original publicity material cleared by SCEA. Lair is a score that fans of large-scale epic music should definitely seek out. It’s still available from La-La Land Records.